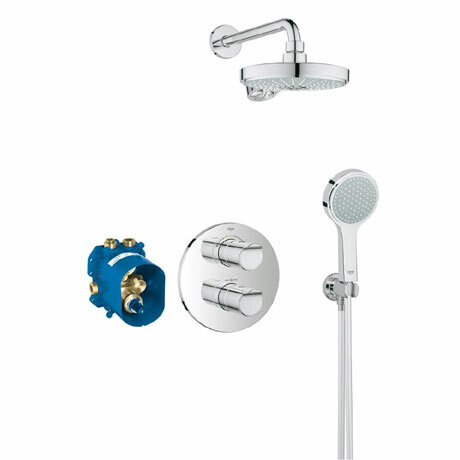 The Grohtherm 2000 Perfect Shower Set is a complete shower package crafted elegantly by Grohe and boasts many safety features. It benefits from GROHE TurboStat® technology so your water temperature stays constant, regardless of any fluctuations in your water supply or water pressure. The easy to grip controls can always be adjusted effortlessly, even with soapy hands while the SafeStop button protects you and your children from scalding. The first limit is preset at 38°C. If desired, temperatures of up to 50°C can be selected upon deactivating the SafeStop button. The Power&Soul Cosmopolitan head and hand shower provide respectively four and two spray types, which you can pick with the simple one-click-showering® system.